The Baths of Caracalla, that are located to the south of Rome, can be reached on Line B on the metro system, from both Circo Massimo and Piramide stations. These are the ruins of what was once one of the grandest and most elaborate bath complexes in the whole of Italy. 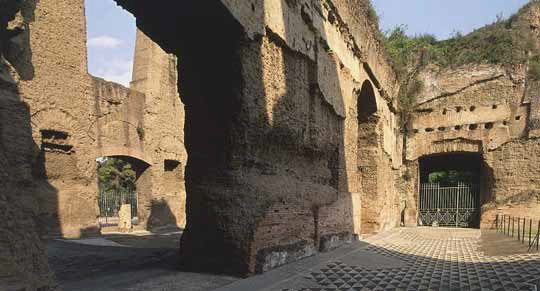 Construction of the baths was started in 206 by Septimus Severus, and completed by his son Caracalla, in 217. Water was fed to the baths from a branch of the Aqua Marcia aqueduct that brought water from the hills close to Subiaco. It has been estimated that 15.000 - 20,000 cubic meters of water per day were required to supply the needs of up to 1,500 bathers at any one time. Still visible today are the remains of many of the original rooms, including the changing room or apodyteria, the the cold room or frigidarium, the warm room or tepidarium, and the caldarium, which was the steam room. There was also an open air pool for swimming. The building had an under floor heating system called a hypocaust, which was heated using over fifty furnaces. 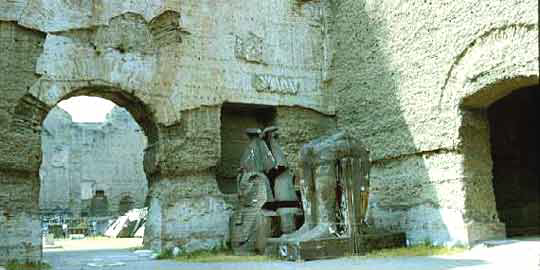 The Baths of Caracalla remained in use until the invading Goths cut off the supply of water in 537 A.D. In later years, the grounds were used to house pilgrims who became ill during their journey. Since the 1930s, the site has been used for outdoor operatic recitals, the most famous of which being the concert of the Three Tenors in 1990. The number of such events have been reduced over the past number of years, in an effort to help preserve the buildings remains. Major excavations on the site began in 1824, which unearthed, amongst other things, the famous mosaics which are now conserved in the Vatican museum, although some indication of the magnificence of the the original building can be gained through the remains of what mosaic fragments and pieces of ancient statues still remain scattered around the grounds.